Dillion Falls. 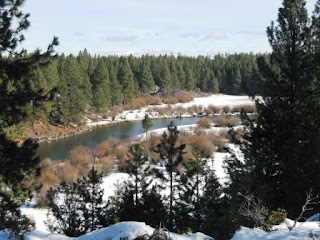 A few miles south of Bend and accessible EASILY in minutes. 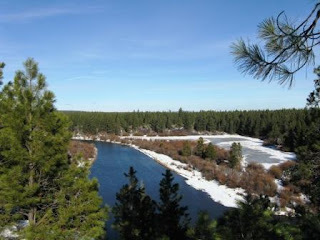 While the falls drop more like a rapid, it is still a dramatic spot and a beautiful site along the Deschutes River. I grabbed a morning jaunt out there just as the new year began. Temps were in the 40's and sunny. There's a very visible influence of volcanic activity in this area. On the right of this photo, you see the cliff of lava. That flow (which I'm also standing on) fills this area for several square miles of denuded landscape. The lava flow buried the river, which stills flows underneath it. This area is also a place where the river loses a lot of water. The porous lava flows act like giant holes into the groundwater table. At some spots, you can actually see where the water just pours into the ground. 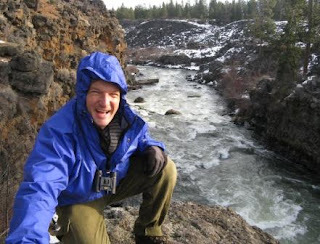 Apparently, billions of gallons of surface water drain from the Deschutes in this area every year. At Dillion Falls, you get views of where the water sometimes resurfaces. The clip below shows water just gushing out of the lava flow. Click below to hear and see Dillion Falls close up. Just below Dillion Falls, the river flattens out quickly and becomes quite serene. 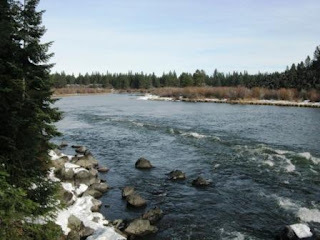 The scenic Deschutes. If you could see it in this low res photo, Awbrey Butte in the center of Bend, is the rise on the horizon in the middle right. Several falls exist along this reach. The hikes area easy for all ages and very close to Bend. Get out here!